Do you have Northern Territory ancestry? This data set contains three volumes, 1887, 1888 and 1890. It's a great genealogy tool for anyone searching their family history and building a family tree. 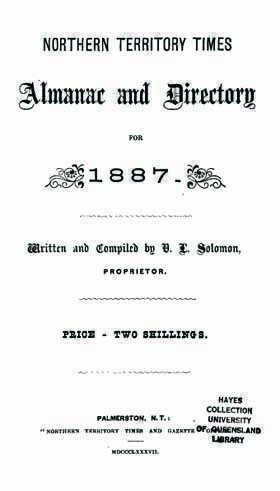 The Northern Territory Almanac Directory (1887 Solomon, V.L) covers everything from the colonial governors to customs licences, from the board of health to the Palmerston hospital and from statistics of imports and exports to the police department. There are over 100 topic categories. There is a brief history of the Northern Territory 'as it is' in 1886, which gives not only a general overview, but also a brief rundown of some events of the past year. The business directory, while it is not extensive, is still useful as it provides details of some of those with occupations in Palmerston, Southport, The Road, Port Darwin Camp and Grove Hill, Twelve Mile - McKinlay, Burrundie, Union, Pine Creek, and Katherine. The public institutions, companies, clubs section is also interesting, as it provides the names of all the committee members for the various societies, clubs etc.. This copy is missing the map which was originally included in this useful guide to the Northern Territory, its people and businesses. This is the fourth edition of the Northern Territory Almanac and Directory and brings together information specific to people, places and businesses in the Northern Territory during 1888. This Directory is rather different from most, in that it contains names of the lessees of pastoral blocks in the Northern Territory, as well as a section on sports results. This covers inter-colonial rowing, swimming, running, cricket, and horse racing events right around Australia. There is a calendar that contains anecdotal information for every day of the year, as well as a chronological landmarks list, which puts events into their historical context. A useful reference guide for those who have an interest in the Northern Territory or its people during this era. The Business and General Directory in this volume is divided into banks, newspapers, public institutions, clubs, insurance agencies, steamship companies, trades and businesses. Information covering early history, exploration, customs, chronological landmarks, maps of mines, hospitals, law courts and the police department, Northern Territory events, pastoral rents, postal information, quarantine, railway fare and distances, rainfall statistics, sporting notes and vessels registered in Port Darwin.